19 Essential Bible Verses and Passages on Apologetics That Every Christian Should Know - Is Jesus Alive? Sometimes you gotta make an apologetic for apologetics. Often well-meaning Christians spout off pious-sounding platitudes like “faith isn’t based on reason, that’s why it’s called faith”, or “God doesn’t need us to defend him, just preach the gospel.” That sounds spiritual, but it isn’t biblical. That’s not the way Jesus operated, and that’s not the way the early church operated either. This is every apologists’ “go-to” verse when defending the purpose of apologetics, and for good reason. While not everyone is called to be a full-time minister, (Ephesians 4:11) Peter says that every Christian is called to give a reason for their hope in Christ. Don’t leave out the “gentleness and respect” part! Paul is giving a checklist of qualifications for pastors. Pastors should not only able to teach sound doctrine but also able to refute those who oppose it. Pastors need apologetics as much as believers — if not more so — since it’s their job to help protect the flock against false teaching. Here again, Paul is instructing ministers to be able to not only teach but to also be able to give a gentle answer to those who oppose the truth. We see here that apologetics can play a role in bringing people to repentance. I love this verse because here God throws down the gauntlet. Can your idols predict the future? Can they declare the end from the beginning? Yeah, I didn’t think so. The apostles repeatedly used the argument from fulfilled prophecy in identifying Jesus. Just read the Gospels or any of the sermons in Acts preached to a Jewish audience. Some people in the modern church will tell you that you can’t reason or argue someone into the kingdom of God. They’ll teach that if you’re just a nice person then people will eventually give you the time of day. That’s not the way Paul operated. He proactively went into the synagogues and used his ability to persuade from the Bible that Jesus was the long-awaited Messiah. Acts 17:2-4 says this was his custom. 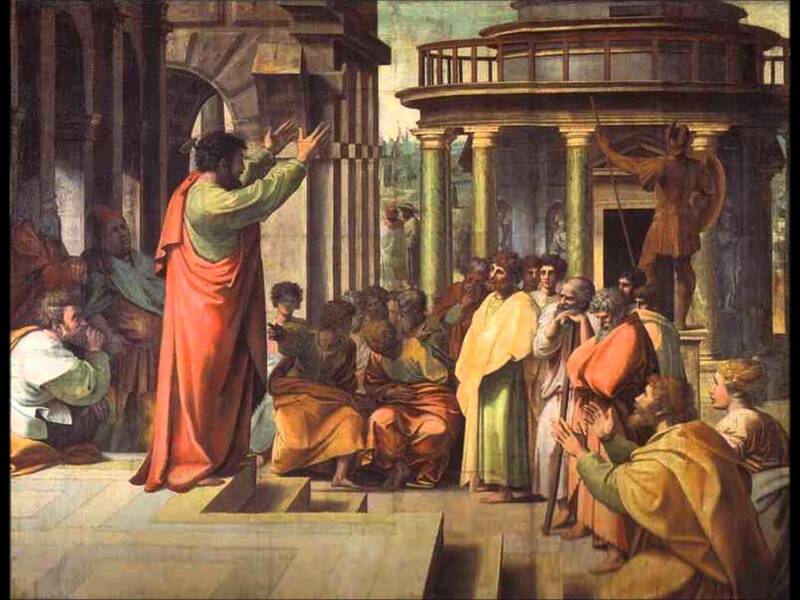 What really sticks out to me is that when some of the Jews turned on Paul, he set up shop in a lecture hall and had an open forum for the next two years until everyone in the area heard the gospel. Daily discussions indicate that Paul wasn’t just preaching at people, he was having some conversations over spiritual things with whoever was willing. This sounds an awful lot like debates, which leads me to my next (and possibly favorite) passage on apologetics. Have you ever watched a great debater, like John Lennox or William Lane Craig and feel like “Wow! I just had church!”? You probably came away feeling strengthened after witnessing the other sides’ arguments fall apart like a Chinese motorcycle while the Christian side came out smelling like a rose, even after tough scrutiny. Luke, by the Holy Spirit, calls this great help to the believer. And I think that’s pretty awesome. Apologetics can help persuade skeptics, but it also builds up the church. Apologetics is a major way of doing spiritual warfare. It’s being able to deconstruct arguments and pretentious arguments that trip people up and keep them out of the kingdom. CS Lewis famously said “Good philosophy must exist, if for no other reason, because bad philosophy must be answered… The learned life then, is for some, a duty.” We are in a war with the hallow and deceptive philosophies of our time: Relativism, religious pluralism, nihilism, naturalism, scientism, critical theory, Marxism, – you name it, it’s all out there. These things have a major impact on individuals and our society. Our job is to give the world a real alternative. Luke’s not writing fairy tales or folklore here. He interviewed eyewitnesses. He carefully investigated everything and being meticulous with his research. He’s writing as a historian giving a thorough report so that our confidence in what we believed would be increased. Similar to Luke’s prologue, Peter isn’t spinning some pious myths or fables here. His message was based on what he was an eyewitness to. John is encouraging a church that is going through a rough time. Some believers were abandoning their faith in Jesus because of the prevailing Greek philosophy around them that taught that the flesh is bad and spirit is good. Considering Jesus was resurrected in the flesh, this was a big problem. He appeals to them by the truth of Christ that he experienced with his own senses. He wasn’t preaching a spiritual, shadowy Jesus. The central claim of the gospel is Christ has been raised. If Christ isn’t raised, Paul says the whole Christian faith is a bad joke and a waste of time. (1 Corinthians 15:14, 1 Corinthians 15:17) Here Paul passes on a creed he was given by other believers before him that list off a host of resurrection appearances to individuals and groups. This creed has become the linchpin for most arguments for the historicity of the resurrection. We know from Paul’s sermon on Mars Hill (Acts 17:21-32) that he appealed to nature and their own moral intuitions. Here Paul says there’s some revelation freely available to everyone, so much so that they have no excuse. The word excuse is “apologia”, which is the same word we get apologetics from. In other words, unbelievers have no defense for their rejection of God. This might be the passage that Paul had in mind when he said the truth of God is evident to everyone through creation. The very existence of an orderly, fine-tuned universe created in the finite past speaks volumes and you really have to plug your ears to say that it came about through purely natural processes. As believers, we are to make the most of every opportunity we get with people outside the faith and graciously know how to answer their worldview. It’s interesting to note here that Paul was writing this letter from prison. He used the words rejoice and joy over and over, and he says he’s there for the defense of the gospel. Even being put in a dirty, dark prison wasn’t going to stop Paul from proclaiming and defending the Gospel with joy. He knew his purpose. It’s always to remind yourself why you are put here. While this list isn’t completely comprehensive, I hope it helps you see the importance of apologetics and gets you motivated to get involved! Historical Truth or Holy Fiction: Did Herod really order the Massacre of the Innocents, or did Matthew just make up a story?